"I See Him Who Sees Me and Knows Me"
This painting of the mother of Arab people, Hagar, is entitled "I See Him Who Sees Me and Knows Me". It was inspired by the words of Queen Rania of Jordan in 2017 that women in that kingdom are free to choose to cover or not, and to choose the color of their head scarf. 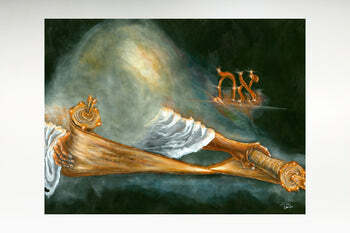 The painting was presented to Queen Rania in 2018 as a blessing to know the love of him whom Hagar called, El Roi. (God who sees) He is the One who answered the cries of Ishmael in the desert and gave him the promise of being wealthy and becoming the father of 12 princes. El Roi is with you, empowering you with wisdom to live in peace with your neighbors and to experience the love of the Eternal One who blesses you with abundant life. May you have joy in seeing your family become healthy and prosperous as you look to Him who "knows you and blesses you". 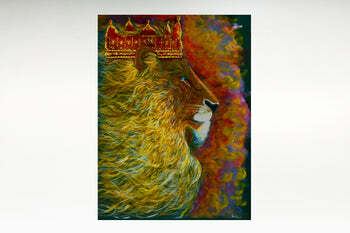 Spiritual Impact Paintings transform hearts and release abiding peace through art inspired by Heaven. These powerful images change the atmosphere everywhere they are displayed. The original canvas artworks were given to the Mayors of Tel Aviv and Jerusalem, and to Prime Minister Bibi Netanyahu of Israel, and one to Queen Rania Al Abdullah of Jordan. Each painting releases Spirit and Life to all who view them. The images speak a blessing to all who see and purchase them. The anointed artist of these 4 Spiritual Impact Paintings, Donna Taylor, was commissioned when she died and went to heaven at age 17. Donna was told by the Lord that her purpose on earth will begin at age 50, and sent her back. That was the year she started traveling with us to Middle East to release life-changing impact paintings. Draw in new customers and bless your business through the illuminated wall framed paintings that accentuate the image for greater impact. 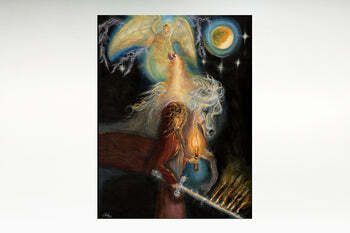 People flock to view the Spiritual Impact Paintings when they glow with illumination. Check it out; they are amazing! All proceeds go toward advancing freedom in the Middle East by blessing all the sons of Abraham. Your purchase is impacting history! Size 9"x12" 15"x20" 24"x32" 30"x40" 36"x48" 48"x60"
Select an option to upgrade your I See Him Who Sees Me and Knows Me - Genesis 21!